POWER REPAIR EXFOLIANT for All Skin Types A scrub/mask that cleans away dead skin cells & smoothes the complexion. The complexion is instantly enhanced with the deep, therapeutic effects of herbs, clay, and granules. 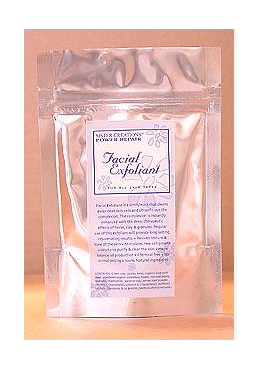 Regular use of this exfoliant will provide long lasting, rejuvenating results. CONTAINS: Green clay, jojoba meal, organic blue corn meal, powdered organic calendula flower, red rose petals, lavender, chamomile, kanolin clay, arrow root powder, vitamin C (ascorbate), vitamin E (tocopheral), buffered calcium, coenzyme Q-10, & MSM (methylsulfonylmethane).